The Kat Lee: Bounty Hunter slot is designed as a short comic strip or a sequence of scenes about a beautiful secret agent Kat who pursues the most dangerous criminals. The slot is equipped with a wild, two Free Spin symbols, a bonus symbol, Bomb scatter and Grenade scatter. You may pick from four coin values ($0.01, $0.05, $0.1 and $0.25), and wager 1 to 10 coins per each of the thirty lines. Therefore, the minimum and maximum bets amount to $0.3 and $75 per spin. The game’s logo is a wild that pays out the largest jackpot worth $25,000 if you hit these five on a payline. 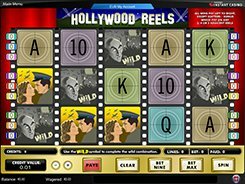 Besides, there are two Free Spin symbols that trigger 3 free spins with all wins tripled if you get two different Free Spin symbols on reels 1 and 5 simultaneously. Bomb scatter and Grenade scatter do not unlock any bonus events, but they pay out up to x50 times a total bet if 3 to 5 identical scatters appear on the reels, no matter where they have landed. 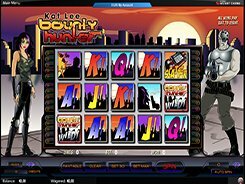 To sum up, Kat Lee: Bounty Hunter is a visually appealing and generous slot with flexible bet amounts and many special symbols that boost your winning chances. PLAY FOR REAL MONEY!